So, usually I play with vehicles going from multiple endpoints going to multiple endpoints and overlapping at hubs. Sometimes I give them orders to traverse the stations in circles. So, I decided to turn on cargodist. And now there are thousands of people waiting at various stations throughout my network. Any suggestions on how to get all those people to their destinations without getting them lost? The beauty of CargoDist is that they'll never get lost. They will use whatever path you provide them to get to their final destination. You can route them directly or through multiple stops and transfers. Yes, well, there seems to be this problem when I turn cargodist on that at one of my hubs 12000 people are waiting for their next hop. At another, for example, 4000. How do I best set up my network to cope with this? Normally I don't play with cargodist, but my trains were rather empty (even at a hub station right between the office buildings) when it was off. So, I turned it on. ^^ I don't remember there being a setting for how far passengers travel, must it be a new one?! You see, I've been too wary to download the most recent version of OTTD. Anyhow, although always tempting CargoDist has nevertheless been too unwieldy for my liking! I wouldn't call in unwieldy. If anything, you need to worry less about what you are doing - just connect everything with everything and let cargodist sort it out. No need for tedious, complicated two-way setups with airport transfers and so on. You just need to get in a different mindset. Station with a few hundred passengers waiting? That's OK. If it gets into the several thousand, well, maybe look into doing something. Hub stations will always attract a lot of passengers with CargoDist, because that's where people change trains (or other vehicles). This isn't a problem in itself unless an individual route is below capacity. The number you really need to worry about is the station rating - there can be a lot of people waiting, but the station rating can still be good if vehicles are frequent. The key in CargoDist to me is to use the cargo flow maps and the drop down details about souce-via-destination. The via is useful because it tells you where people change at the moment. If a lot of people are changing, perhaps consider running more direct trains to the final destination. Also consider getting frequency up on trunk routes. You probably also need to get more vehicles on feeder bus/tram routes as they become a lot more important with CargoDist. Think about what trunk and branch flows there are. Also consider calling patterns - running a mix of express and stopping trains can cut out overcrowded intermediate stations. Think also about the capacity of your trains - get higher capacity trains into trunk routes. I love CargoDist, without it the game would become a bit boring to me. there's a really simple rule of cargodist: if a passenger goes (on average) 4 stops until he reaches his destination, you need 4 times the capacity compared to normal gameplay. just turning on cargodist without adjusting your networks/capacities is almost never going to work. if you find yourself still drowning in passengers, increase the value for "effect of distance on demand", so people will take shorter journeys. If you have passengers piling up at a station, especially a hub station, hit the + button next to the number and sort by "via" first. Usually it will be a single route that's causing the backup. E.g. you'll have 4000 passengers waiting, 3500 of them want to go via Predchurch. So just increase the number of or capacity of the trains/boats etc running on the line to Predchurch (making sure to avoid bunching and not exceeding line's max capacity). Another pointer is to avoid over-reliance on hubs. In a network with a single, central hub, the load on that hub (and on the last sections of track before it) are huge, and towns that are close together but not on the same train line take a long time to get between. The solution is to start to provide lines that skip the hub and provide shortcuts You can also just avoid hubs from the start. Depending on the topology of your map, you should aim to have criss-crossing lines, avoiding excessive hubs. Lines should be as straight and direct as possible, and where two different lines meet, they share a station. 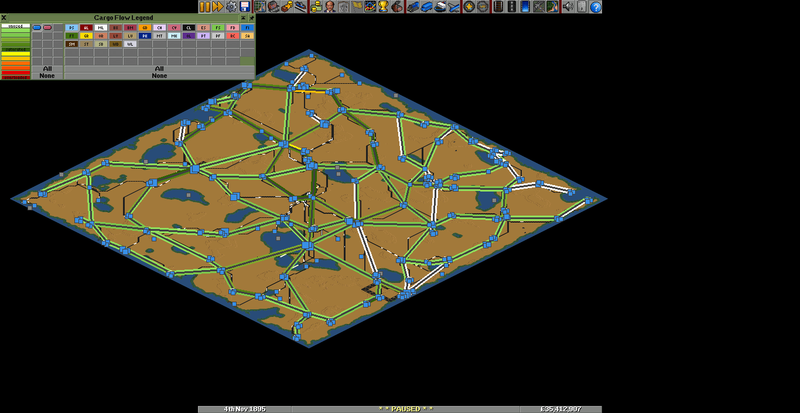 Look at how my cargodist games end up: https://i.imgur.com/PxxlGw0.png There's no centre to my network, a few stations where 3 lines meet, lots of stations where 2 lines meet. The network is like a grid, but not too perfect, it just comes from attempting to build straight, logical lines to connect towns that are are lined up nicely.